Good pilots always undergo type-specific transition training whether the regulations require it or not. Maintenance technicians have similar leeway, but just like pilots, great professional technicians also undergo type-specific training. For Twin Commander technicians that training typically comes in a formal class. Each authorized service center is contractually required to send at least one of its Twin Commander technicians to formal training or recurrency each year. For years that technician training class was conducted by FlightSafety International, which also administered simulator-based pilot initial and recurrency training for the Twin Commander. Following the sale of the pilot training function to Simcom, Eagle Creek Aviation assumed the technician training role. Eagle Creek Technical Adviser Mike Grabbe has been teaching it at the company’s Indianapolis facility for five years. Grabbe has decades teaching technicians how to work on Twin Commanders. After many years as a floor mechanic for various operators he taught beginning mechanics, and then the Twin Commander course at FlightSafety for more than six years. In addition to the dozens of technicians who have been through the class in the past few years, Grabbe has also welcomed three owner-pilots who are curious about the inner workings of their Commanders. Most of the learning happens in the classroom using components from the aircraft, although students will get to the shop floor to speak to working technicians and crawl around airplanes. Everything from service publications, inspection programs, landing gear, flight controls, electronic system, fire suppression, annunciators, environmental systems, fuel, and engines is covered in those seven days. 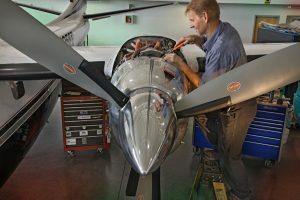 Technicians working on European-registered aircraft need an additional day for testing, an engine-specific class, and some more hands-on experience at home to complete the training. Most students tend to have some experience with the airplane. Grabbe said the typical student has somewhere between six months to a year working on Commanders, although he has taught maybe half-a-dozen newbies over the years. Eagle Creek hosts two technician training classes a year, one in late summer to early fall that recently wrapped up, and one in mid to late spring. The company is thinking of adding a winter class for operators who work fire season. Each class can accommodate up to 12 students. For more information about Twin Commander maintenance training, contact Eagle Creek Aviation at 317-293-6935.